Dr. Hamdan Joined Summit nephrology in the Spring of 2015. 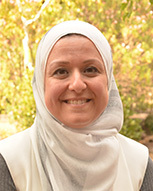 She grew up in Jordan and completed her medical training at the University of Jordan in Amman. She immigrated to the United states in 2006 and completed her residency in internal medicine at the University of Arizona in Tucson. She subsequently completed a fellowship in Nephrology at the University of California, Davis. She worked in an underserved area for three years, to help provide quality health service to indigent populations. Dr. Hamdan is passionate about providing compassionate quality care for her patients. In her free time she likes to run, read, travel the world and spend time with her husband and two little girls.